Bells have been ringing out over Burton since the 17th Century. They were used to spread news of war, to announce the death of kings and to sound the end of the working day. 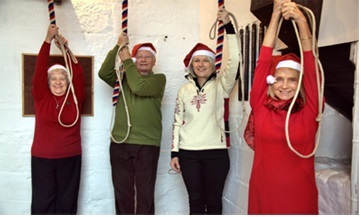 Today we still ring the bells for special occasions, but also because we get a lot of pleasure from making sure this old English tradition continues. We try to ring before as many services as possible; a single bell for 5 minutes before the 8.45am service, change ringing before the 10am service, and if possible we try to do a special piece of ringing, a Quarter Peal, before Evensong. If you would like us to ring to mark an event, either national or local, then please let us know. We enjoy a time of fellowship and fun when we meet to practise ringing the handbells. We play in church for festivals when appropriate and provide outreach to the wider community by playing at other venues when invited. We have played at Neston Library, nursing homes, the Burton Society etc.